We sell a kite mapping pack with two kites and a lot of tails to help you get going. 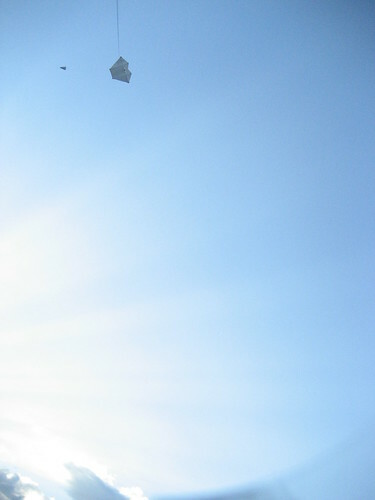 Kites can also be used in large flat areas with no power lines or trees, such as on oceans or lakes, beaches, or deserts, by towing them behind a boat, car, or bicycle. Keep in mind that going downwind will drop the speed of your kite. Kite Aerial Photographers, or KAPers, often select expensive kites which can lift large weights, and many use heavier, customizable cameras such as digital SLRs with remote control targeting or stabilization. If you just want to put a camera in the air for the lowest cost and highest reliability, we recommend a few different relatively inexpensive kites, paired with the PET Bottle Rig. We sell two kites and a 15' Fuzzy Tail for high-wind flying, together as our Kite Mapping Pack: 9ft. Dazzle Delta is only $46 and a very good, easy flier. It doesn't pack down very small, but is a very affordable and high quality light wind kite. 7ft. High Sky Delta is only $30 and a great complement to the Dazzle Delta, providing easier flying in high winds. Levitation Delta - ($65) 9 ft. wide - a strong and stable flyer in 7-20mph winds. In high winds it can take some effort to reel in, as it has a lot of lift. The spars all split in half and it packs down easily to 40." Good, high flying angle. Also available in 7 and 11 foot versions for high and low winds. Zenith Delta - ($70) 7 ft. wide - This one is fantastic, a strong and stable flyer in even light winds (7mph). Not as much lift as the Levitation and it doesn't break down as small, but it is easier to handle in high winds. A great all-around kite. Fled - ($110) stable, strong, very light-wind kite that flies at a line angle of 65 - 70 degrees. This kite is very quick to set up and simple to adjust. It flies in a wide range of conditions, and is a "go-to" kite for many KAPers. The high line angle is very useful for flying in tight spaces. Gomberg Delta Conyne - ($37) - Harder to launch, and not great in light winds, but once it's in the air it's a stable flyer. A favorite of the Gowanus Conservancy in strong winter winds. Making your own kite is great -- designs can range from easy and quick to bigger more ambitious one that can be more portable, stronger lifters, or light-wind flyers. Mathew has step by step instructions as well as a spreadsheet of dimensions for a quick-to-build DIY Delta Kite. This is a proven design that flies well. He uses tvvek and bamboo, but wooden dowels and plastic sheeting will work as well. Astoicof wrote great build notes and a PDF on using plastic sheeting to make a delta kite..
Jeff Warren and kids at Parts and Crafts have gotten good results from a mylar copy of the Dazzle Delta..
Safidy has been playing with NASA's Kite Modeler software and making DIY deltas. Grassroots Mappers in Peru have had good luck with plastic and bamboo kites. Mathew also made a series of Tyvek and Bamboo Fled kites based on the designs of Brooks Leffler. The third has been extremely successful at lifting cameras to very high flying angles, and he can now recommend others to build the same. follow his instructions in the link above. Kiteplans.org and the Kitebuilder forums are great online resources. The book One-hour Kites by Jim Rowlands provides excellent plans and construction details. Dan Kurahashi's Japanese Kites, Concepts and Construction has more great plans, great charts on predicting lift, and some excellent instructions on making plastic bag kites. Nathan Craig's Mendeley Group may require setting-up a free, public account.